It was cold and there was a light dusting of snow on the ground for the Athletics Ontario Cross Country Championships at Morrison Meadows in Bracebridge. The course was one of the most challenging courses we have seen in years with ice, wood chips, mud and rolling terrain. The Lions Valley Athletics Team arrived at Morrison Meadows Saturday afternoon to preview the course and prepare for Sunday's races. Lisa from Palermo Physiotherapy and Wellness Centre and Head Coach Kevin J Smith comprised the support crew accompanying our athletes. This is one of LVA's top events and the continued growth in our members participation at this annual event year over year is great to see regardless of the weather. The Masters 5KM was the first event of the day and our Men's 30-39 Team of Darryl Rowan, Jerome Louvel, Akeel Ghaib and Michelle Stevenson were ready to race in the cold temperatures. The first 3KM loop saw Darryl show his newfound running strength as he pulled away from his team mates. Akeel and Jerome were separated from each other by seconds for almost the entire race. Michelle had a great start but tweaked her calf on the challenging course. She made the wise decision not to continue and have it looked after. In he final 2KM loop Darryl moved his way up the field to 59th position in 20:35. Akeel held his lead over Jerome and they finished 77th and 82nd in 21:51 and 22:08 respectively. Together the team finished 4th in the Men's 30-39 category. Our Senior Men's team of Michael Gill, Eric Labelle, Sean Patterson, and Chad Patterson were up next for Lions Valley Athletics. 5 x 2KM Loops totaling 10KM was going to be challenging given the rough terrain and sub-zero temperatures. Michael Gill got into his groove during the first lap and then proceeded to run through a huge chunk of the competitive field over the next 4 laps. It was spectacular to see him just keep moving up in position so effortlessly, making it one of his best XC races with Lions Valley Athletics. Michael finished in 34:37 and earned his 15th placing in the Senior Mens event. Eric Labelle, had a very different experience where he finished 28th. He had to run a gutsy race and fight to maintain his pacing in the final laps as the cold temperatures threatened to end his race early. Eric crossed the finish in 36:00 and went straight to the medical tent to get warmed up and prevent hypothermia. Sean Patterson and Chad Patterson were never separated by more than 15m throughout the entire 10KM. It provided them the valuable opportunity of having someone to work together towards the finish. Sean & Chad rounded out our Senior Mens Team finishing 43rd and 44th respectively. Mike, Eric, Sean and Chad together put Lions Valley Athletics 6th in the Senior Mens Team Category. Rebecca Stevenson was the sole Lions Valley Athletics athlete in the Midget Girls 4KM event. Her final cross country race of 2017, one that has been Rebecca's breakout year where she showed a new strength when racing earning her new personal bests. Her race started just as the temperatures started to rise above zero making the course muddy and slippery. Running her own race, she got into her rhythm and worked her way through the challenging course to place 106th. Her determination and drive meant that nothing could have phased her during the 4KM race she finished in a time of 20:41. 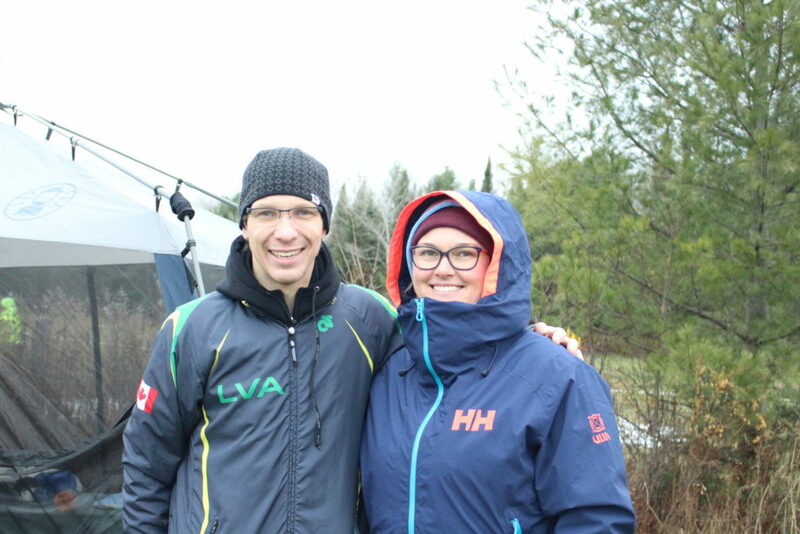 On behalf of the all our athletes competing in Bracebridge, Lions Valley Athletics has many thanks and appreciation for Lisa Clifford of Palermo Physiotherapy and Wellness Centre who volunteered her time as support crew for this cross country meet. Lisa was a fantastic help with taping, massage, physio and cheering. This is the first year Lions Valley Athletics will have athletes competing at the Canadian XC Championships. Good Luck to the LVA Masters Mens 40-49 Team! Starts with the Masters 8KM at 9:00AM Sat Nov 25, 2017.